Wow! Buddy Fruits are so Yummy! At first I wasn't really sure if I would like them, I mean the flavors sounded good, but obviously the fruits in Buddy fruits are mashed and my stomache just dosen't handle mooshy things too well. I was so surprise when I took my first... "Drink? It's like a straw, so I am going to say drink." The texture was like an applesauce, and I really loved it. For my review of Buddy fruits I received 16 pouches which included 4 different flavors (I received 4 of each) They included.. Apple and Banana, Apple and Multi Fruit, Apple and Strawberry and Apple and Cinnamon. Out of all of them I would say my favorite was the Apple & Starwberry. My second favorite would have to be the Apple Cinnamon. I am a huge sucker for apple cinnamon applesauce and this was almost the exact thing! I think there could have just been a touch more cinnamon, but overall I really liked the Apple Cinnamon! My third favorite was the Apple and Mulitfruit. When I first took a sip I was a little surprise because it was more tart then the others. But once you've taken that first sip it evens out and tatse just as great as the others! I love how there is so many different fruit flavors in with the Apple Multifruit. Mixed together in this small pouch is a mixture of; Apple, Banana, Passion Fruit Juice, Mango, Strawberry and apple juice. Overall I am very very happy with Buddy Fruits. Oh! And did I mention, each pouch is 100% natural! 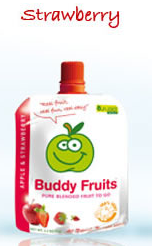 I am positive if you try Buddy Fruit you will love it! :)! 1 of you will receive a full 18 pack display box of Buddy Fruits. Mandatory entry: Visit the Buddy Fruits Website and let me know which flavor you would most like to try. I'd like to try the Apple & Bannana flavor. I like BUddy Fruits on facebook @Crazycatlady Kelly! 2-I like BUddy Fruits on facebook @Crazycatlady Kelly! 2-I like you on facebook @Crazycatlady Kelly! The cinnamon sounds really good! My daughter has had some other brands of squeezable fruit, but I have never seen this brand, and Buddy Fruits come in some really great flavors! I entered your eUndies giveaway. I entered your Ultimate Organizer giveaway. I entered your Uprinting giveaway. I entered your Visa giveaway. I entered your LIttle Blue Sister giveaway. I entered your Five Accessories giveaway. Strawberry and Cinnamon will prob be my fav! 28% of voters have voted for this photo. I'd love to try the Apple & Starwberry. Thanks for the review and giveaway! I'd like to try Banana. I'd most like to try apple and strawberry. Thanks.